Water gushing uncontrollably through your house is hazardous, unsafe, and will quickly cause major flood damage to your home's interior. As long as that water is coming from your home's own water supply, and not from outside sources, you can and should shut it down very fast. 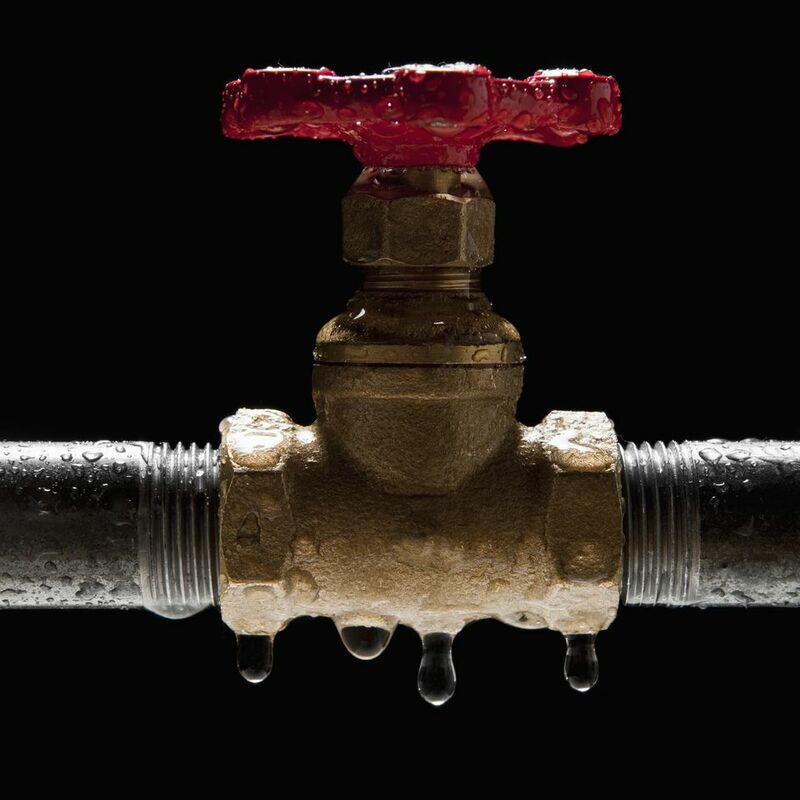 Learn how to find and turn off your home's main water shut-off valve. The first step is to physically search for your house's main water shut off valve on the inside of the home. Typically, it will be located on the perimeter of the house, since that is where the water first enters your house. Also, stay on the side of the house that is facing the street. Your water main begins at the street and heads in a straight line to your home. When you find the valve, turn the handle or knife-style valve. If you still cannot find the cut off valve after physically searching for it, one alternative is to check the property inspection report that was completed for you when you were in the final phases of purchasing your home. Look in the plumbing section of the report. This section should locate the shut-off valve for you and have a photo of the valve. Even if the water system was not defective at the time of the property inspection report, the report should still note the locate the shut off valve as a matter of course. If the previous methods fail, there is another valve located at the beginning of your water main, at the boundary line of your property and the street or sidewalk. Find the ground-level metal or plastic utility box trap door located at ground level. Call the water company's 24-hour emergency contact line. Staff may direct you to shut off the valve by yourself or to wait for an emergency dispatch team. A knife style valve is a straight handle that, when open, runs parallel to the pipe. Turn this knife handle a quarter turn to shut it off. Knife style handles permit turning in only one direction; a metal stop prevents turning in the other direction. Similar to a hose faucet, this round handle must be turned several times counter-clockwise to fully shut off the water. At the streetside ground-level utility box, lift the lid and set the lid to the side. If there is dirt or sand, remove gently with your hand or with a garden trowel. Do not discard the sand or dirt. If you live in a climate that freezes in the winter, this sand or dirt is required to prevent the pipes from freezing and bursting. After clearing the box, you will see the glass-covered meter that may have a secondary cover to protect the glass. Ignore this as it has nothing to do with shutting off the water. You may find two valves in the utility box. Street Side Valve: This will be on the street side of the water meter. This turn-off is designed so that only the water company can turn it off with a special tool. Do not turn this off. Even if you manage to get a wrench on this, you may find it exceedingly difficult to turn. Also, there may be legal ramifications associated with turning off the water company valve. House Side Valve: This will be on the house side of the water meter. It may have a knob for turning or it may have a nut. If you have a water leak or just need to turn off the water in your home for remodeling or repairs, you must turn off your water upstream at some point. In all homes, you can shut off the water at the main water cut off valve. This turns off water to the entire house, even outside spigots. Luckily, many newer homes implement a number of upstream shut off valves that you can use, short of shutting off water to the entire house. If you have a leak in your toilet, sink, clothes washer, or bathtub (with exposed plumbing), your first option should be to shut off water close to the source as possible. Toilet: Look under the toilet, against the wall, for the flexible metal tubing. Turn the handle clockwise until the handle stops. Do not force, as most shut off valve handles are plastic and can easily break. Sink: Look under the sink cabinet. You will see two sets of flexible metal tubes. Turn the handles on both valves clockwise to shut them off. As with the toilet handles, these are often made of easily breakable plastic. Clothes Washer: Some houses have the valves clearly exposed above and behind the washer. If this is the case, turn both valves clockwise to shut them off. If you do not see these valves, slide the washer outward and you will likely see them. Bathtub: Bathtubs with exposed plumbing will have shut-off valves clearly visible. Turn both valves clockwise. Shutting off the water at the cut off valve located within the house is the best option for leaks that cannot be shut off by local valves. It will cut off your home's entire water supply, allowing you to open up any pipe within the house. The property inspection report is always the best way to locate the shut off valve. Failing that, use your detective skills to narrow down the location of the valve. In most cases, the shut off valve will be near the perimeter of the house. Keep your focus on-grade. So, if you are in a basement, you will be looking at eye level or above. If you are on a ground level floor, you will be looking down. Track a line from the water meter to the house. Go outside and stand on top of the water meter utility box. Imagine a straight line extending from that point to the nearest point on your home's exterior perimeter. Water lines will take the shortest path to reach to a house. Where that line meets your house is likely where the house's shut-off is located. Sometimes the shut off valve will be located behind a plastic access panel. A PEX plumbing manifold is a type of plumbing collection point that is increasingly being installed in newer homes. With a manifold, two large PEX pipes, one hot and one cold, are branched off to various parts of the house. Plumbing manifolds have shut off valves that can shut down water to the entire house.